Caraselle Direct – Home Accessories Products Portable cloths rail are now available you can buy online. I’ve hopefully given you some inspiration on options for Clothes Rails which are suitable for a children’s room in my previous article Children’s Clothes Rails, so I wanted to also go through accessories to go on the rail and other storage possibilities for a child’s bedroom. Often in a room, which is either small or an awkward space, good storage is important in order to avoid it looking like a toyshop, or to be honest, a complete mess! S o what are the options? Well firstly, the clothes rail/wardrobe itself – hanging canvas storage such as Wardrobe Hanging Organisers are great for storing sweaters, shoes and many other clothing items or smaller items such as toys/accessories. You want something that doesn’t take up too much space and this one does just that being only 15cms wide. 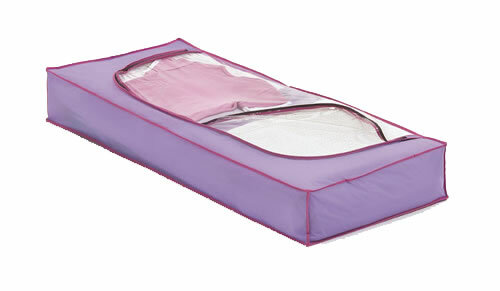 Small on size but it will hold several pairs of shoes, trainers and socks or just leave it to your kids’ imagination! 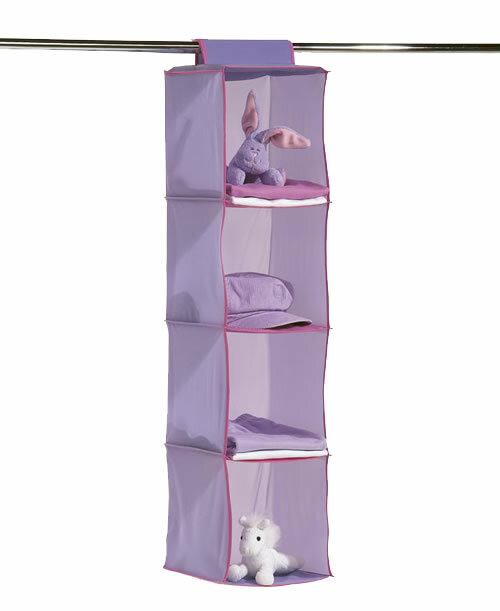 You can also make the most of your kids’ wardrobe hanging space with this fabulous Four Shelf Sweater Organizer, this one matching the shoe hanger and made of soft touch material in lilac with pink binding. Not only for sweaters, but can be used for toys, t-shirts, or whatever your kids wish to put in it. It measures 90cms in height, 22.5cms in width and 22.5cms in depth. So other areas where you should make use of for storage include everybody’s favourite… under the bed! We’ll come to that, but have you considered using the door too? I have hooks on the inside of cupboard/wardrobe doors for small accessories/scarves/belts… but don’t just go with the obvious! I’ve made use a Hanging Magazine Organiser in my son’s room, which is a really useful Organizer because it can be either hung from a hook or can be used with the 2 hooks, included to hang over a door. Featuring a large pocket for magazines (or small books and comics!) and 3 hooks, it is a great use of space. 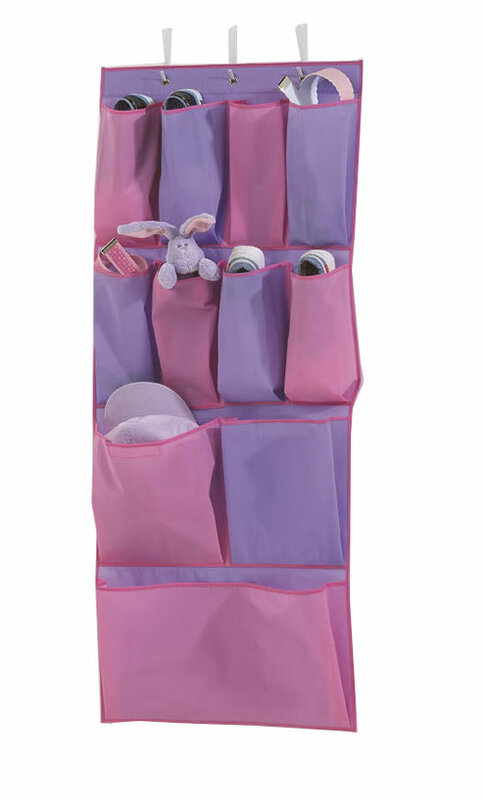 Similarly the Kids Over-Door Hanging Organizer will make use of this normally wasted space with 11 pockets, this beautiful organiser can be used for all the bits and pieces your kids love to store – toys, hairbrushes, gloves, stickers. Anyone who has children will know they love putting things into pockets and bags, so this will even encourage them to tidy up!! Plus they make great presents for kids. Now for the favourite hidden storage place – under the bed! Everyone makes use of this space, but if you store items properly under there you’ll actually be able to find them again! Plus, using an Underbed Storage Chest will actually provide you with more space, because it will be organized. 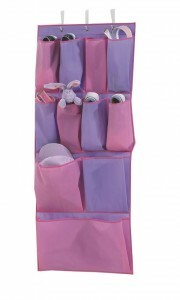 This one has a soft touch material and it’s Lilac colouring with pink binding and zip matches hanging organizers and hangers in this range too. It has a clear see-through window and will look fab in girls’ bedrooms. It really is an ideal storage item for clothing, toys and more! 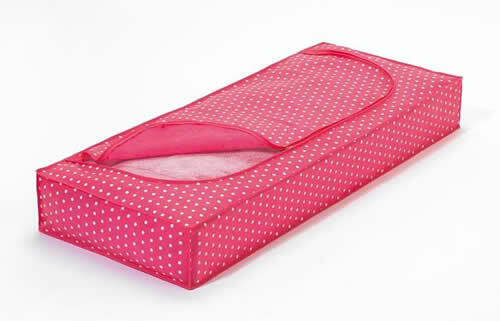 There is also a pink with white spots Underbed Storage Box for those who need everything in pink! Need even more space under the bed? Keep an eye out for my next article when I’ll tell you about a brilliant new product, which will transform everyone’s favourite storage area!! !